"You don't read the book, the book reads you." CBS Films has revealed the first full teaser trailer for the horror adaptation of the beloved book series Scary Stories to Tell in the Dark, produced by Guillermo del Toro. And it looks creepy as hell, with a number of stories from the books coming to life in the freakiest of ways. The film is actually directed by Norwegian filmmaker André Øvredal (Trollhunter, The Autopsy of Jane Doe), and it's also produced by and co-written by del Toro. The horror anthology features various frightening stories based on the books, most featuring younger kids. With a cast including Zoe Margaret Colletti, Michael Garza, Austin Zajur, Gabriel Rush, Kathleen Pollard, and Gil Bellows. This new trailer gives us a bit more than all the TV spots, and seems like it might live up to the scariness of the books. You can still watch the first four TV spots for Scary Stories to Tell in the Dark, to see the original tease. Turn out the lights and prepare for terror… the Jangly Man is coming for you. A group of kids face their fears in order to save their town. From the dark imagination of Guillermo del Toro, based on the iconic book series, your first look at Scary Stories to Tell in the Dark, in theaters this summer. 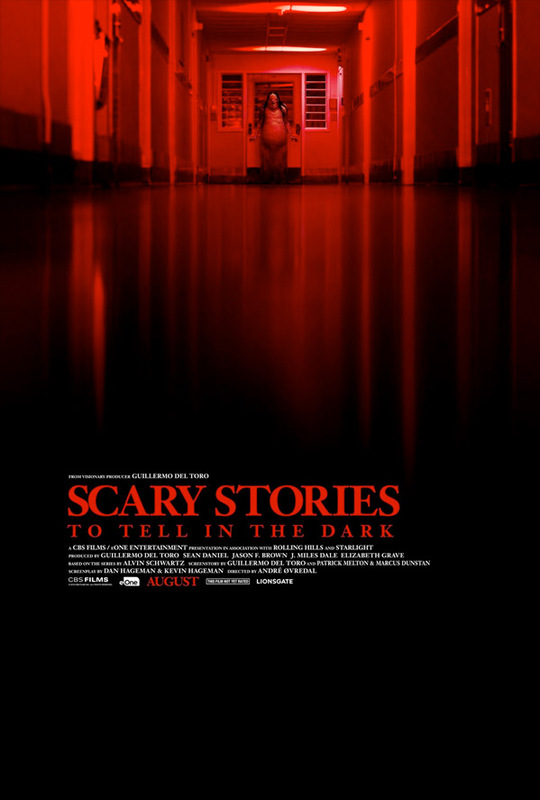 Scary Stories to Tell in the Dark is directed by Norwegian filmmaker André Øvredal, director of the films Future Murder, Trollhunter, and The Autopsy of Jane Doe previously. The screenplay is written by Dan Hageman & Kevin Hageman, with revisions by John August, Guillermo del Toro, Marcus Dunstan, and Patrick Melton. Based on Alvin Schwartz's book series of the same name. It's produced by Guillermo del Toro, Jason F. Brown, J. Miles Dale, Sean Daniel, and Elizabeth Grave. CBS Films will release Øvredal's Scary Stories to Tell in the Dark in theaters everywhere starting August 9th, 2019 later this summer. First impression? Who's down?